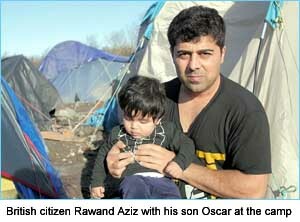 The Guardian has a touching story of two British citizens, Rawand Aziz and Saman Sharif, presently living in a French refugee camp. They had repeatedly asked permission to bring their families to the UK, but the applications have been refused by the Home Office. So when their wives and children came to France as refugees, the British citizens joined them and are now reunited (in a cold tent, in winter France). For the first three months of residence, there are no preconditions on the residence of the British citizen and their non-EU citizen family members (in this case a wife and children). The adults can immediately work without permission, and the children can go to school. The British citizen and the non-EU wife can work at any job, though the British citizen should keep detailed pay and employment records for later use. They do not need to earn a specific amount to remain legally in host EU member state. They can move together as a family to any other EU member state (except not initially the UK), such as Ireland or Germany or the Netherlands. They can do this to be closer to family, or for more work opportunity, or for whatever reason they have. They do not need permission to legally move. To be 100% clear, I fully understand these families are in a very difficult situation and they likely have very limited financial resources to move to a warmer safer place which has more work. But they need to know that they presently have options under EU free movement law because they are a family and one of the family members is an British (EU!) citizen.